Here’s another opportunity to voice your support for a network of greenways and trails that connect the places where we live, work, learn and play. As you contribute to a shared vision for our city, remember that greenbelts offer an inviting and easy way to move throughout our community as a pedestrian or cyclist experiencing our natural landscape and heritage along the way. Greenbelts also help protect creeks and rivers, our water supply, and habitat for native plants and animals. And greenbelts help you access natural areas that contribute to your spiritual and physical health as well as to the economic vitality of our city. Here is an excerpt from a recent City of San Marcos press release. Read the full release here. That is the question the City of San Marcos will be asking residents over the next several weeks as part of a visioning process to update the City’s 1996 comprehensive plan. 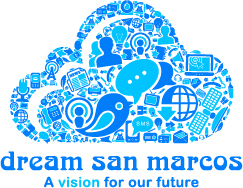 City staff will gather ideas from residents about what San Marcos should become in the future using online software, suggestions by email, comment cards, and more traditional public events. Activities will include meetings with citizens, businesses, students, and civic groups, as well as presentations at City boards and commissions, community events such as the Farmers Market, and a daylong public input session. To submit your ideas online, visit http://sanmarcostx.ideascale.com or send them by email to [email protected] For more information about times and locations of public events, visit the city website at www.sanmarcostx.gov/ideas, send an email or call the Development Services Department at 393.8230.